Someone is already showing off a knack for accessorizing at the tender age of two! While her style has always been influenced by her parents, because duh, North West carried a pink purse, adding a cute, feminine touch to her otherwise casual outfit. She was out and about in distressed black skinny jeans, a cozy, white, and sleeveless, turtleneck sweater, and a pair of classic Converse. It was a ridiculously cute street style look and honestly something I could see plenty of my friends or her relatives wearing in adult sizes. That means it was classic. The tot is known for having a crazy expensive closet, as designers gift her and her mother Kim Kardashian with lots of pricy clothes baring names like Balmain, Lanvin and Wang. She is often dressed in black and has demonstrated a propensity for the monochromatic. However, this black and white outfit got a girlish and appropriate kick from her satin-y pink bag. Let's not worry "who" she is carrying. Let's just emit chorus of "Oohs" and "Ahs" over how insanely adorable the big-sis-to be is. 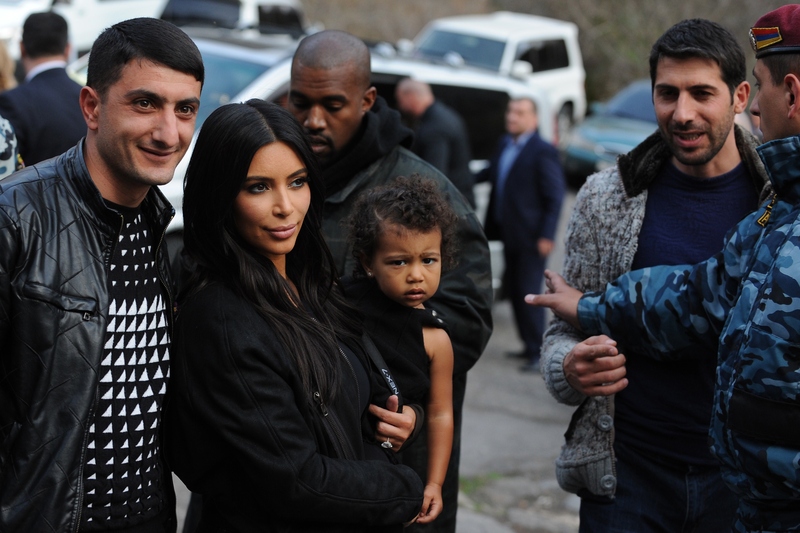 Lil' Nori has a big gig ahead of her when her baby brother arrives and she will approach the new role in style, of course. But check out how the bag dangles off her arm! She already is an expert purse carrier. Even the rips in her jeans are in all the right places and give her outfit a sense of balance. We know, we know! High turtlenecks can be constricting and itchy! But the little girl is so, so cute in hers. I think that I like her better in this street style ensemble than in, say, her amazing, customized Balmain blazers. North West's style cannot and will not be denied. I do, however, admit that I can't wait to see what kind of outfits her baby brother will rock when he finally makes his grand entrance. I predict leather sweatpants and hoodies, like in a neutral color palette, will be staples in his wardrobe.